Good morning friends! I have missed so many of you over the past couple of weeks. Next week I should be back on track. We enjoyed an unexpected additional week with our daughter who returns to college this weekend. We have been very busy in a pleasant way; taking day trips, a weekend trip and visits with grandparents, lunches with mutual friends, lots of shopping, hikes etc. So I have not had much time to blog. So while my husband is off on a hiking trip, and my daughter is off at the gym, I am taking some time to say good morning! I have missed my friends here in blogland! I hope you are all well! I didn't stop sewing/crafting the entire three weeks. 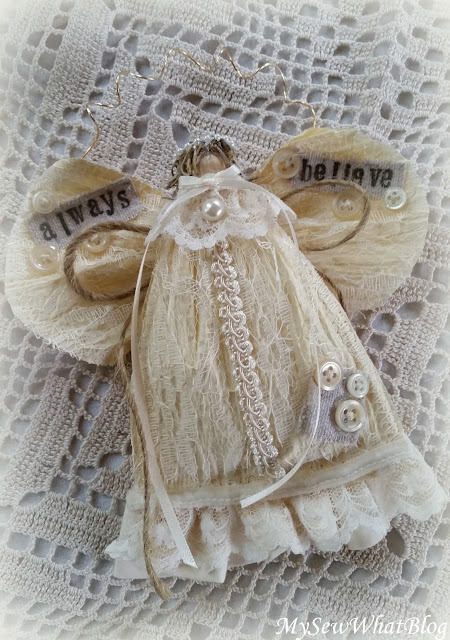 I managed to come up with a lacey version of my angel ornament but it took me most of the day putting her together and completing her. I don't know if it was the heat and/or humidity but I was toast by the time she was done. These ornaments are somewhat labor intensive anyways as there are so many steps. By labor intensive I mean that it generally takes me about an hour to complete one angel ornament. 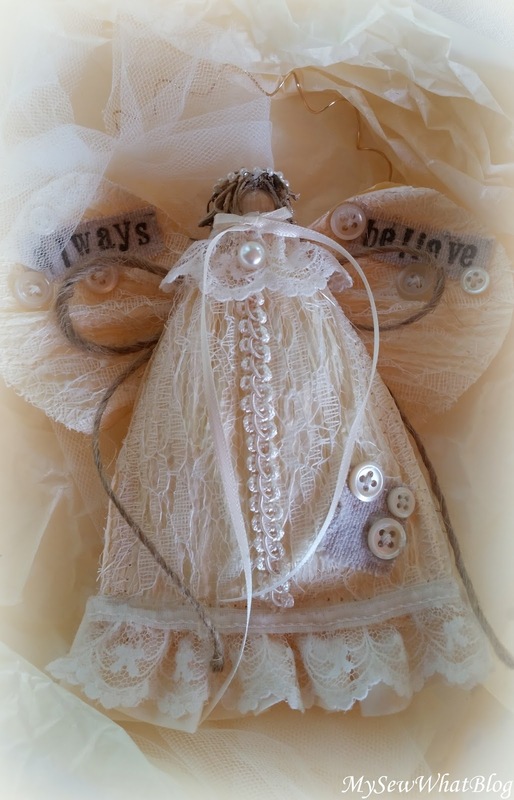 This one took me the better part of a day and of course by adding a layer of lace on the dress and wings and hand stamped words, well, it added more steps! Here she is! Once all the steps were completed I decided one more step was called for.... a tulle blow. 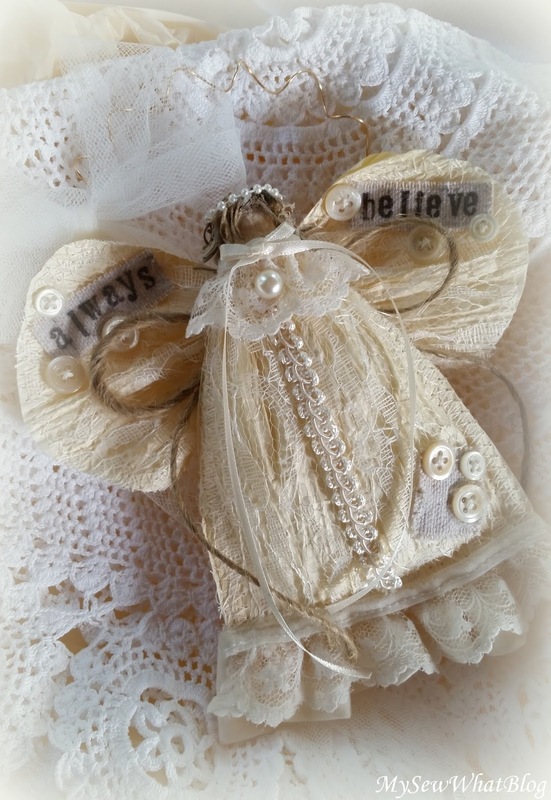 The bow adds a soft, sweet finish to my angel ornament! 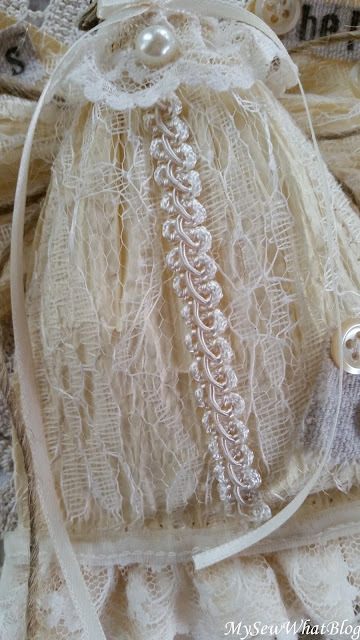 I like the lace too! Here is a close up of the lace overlay! I machine stitched it onto the top layer of paper before she was stuffed and embellished. I also stitched a layer to the top wing. It gives it a much richer appearance. Overall I am pleased with the way she turned out. I have others cut and ready to go.....I also have some pillows and other items that I am anxious to stitch up and share with you. This is what I have been up too over the last couple of weeks. My usual "stuff" has been a bit on hold as we spend some time with our daughter. Once she heads back to school we probably will not see her again until Thanksgiving. It has been a lovely visit and I will miss her when she leaves this weekend. Hope you are staying cool! It's been hot with very high humidity here in NH so I am looking forward to some cooler, dryer weather and of course fall: my very favorite season!